Comments: The battle for the galaxy! Star Wars: Battlefront II gathers together a galaxy of heroes, villains, droids, and vehicles for plenty of intense combat and epic battles. From the Clone Wars to the Galactic Civil Wars, Star Wars: Battlefront II gives you command of the action! Storm into battle with a squadron of clone troopers, each highly trained in special combat functions and genetically engineered for superior strength, stamina, and skill! Clone engineers support the combat forces by repairing weapons and equipment and using their technical expertise for defense or assault. The Clone Engineer is a repaint of 2005's ROTS Clone Trooper III-41, but with an all-new head sculpt. Clone sharpshooters are highly trained marksmen whose primary purpose in battle is to target infantry forces with devastating long-range fire. 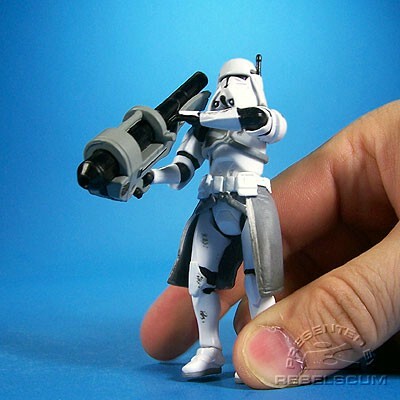 The Clone Sharpshooter is a repaint of 2007's TAC Airborne Trooper. These genetically engineered soldiers are designed to fight the enemy with unrelenting and unwavering intensity until their mission is complete. The Clone Trooper is a repaint of 2006's TSC Combat Engineer Clone Trooper. Galactic Marines are front line forces that are sent into battle to take on enemy forces that are especially powerful and difficult to conquer. The Galactic Marine is a repaint of 2007's TAC Galactic Marine with an all-new weapon. In the game's character selection screen, this characrter is identified incorrectly as a Clone Commander. Watch the Heavy Trooper take aim! These front-line troopers receive special training to take out enemy vehicles, using powerful rocket launchers and other heavy weapons. The Heavy Trooper is a repaint of 2005's ROTS Commander Bacara with an all-new weapon. Jet troopers engage in fast-strike maneuvers using their jet backpacks to ambush enemy forces and perform rapid air attacks. The Jet Trooper is a retool of 2005's ROTS Deluxe Clone Trooper with an all-new weapon and jet backpack. The head is new and the feet now have peg holes. * This set was originally released in 2007's TAC Clone Pack, as a Previews exclusive.